For the open source sharding framework, see Gizzard (Scala framework). 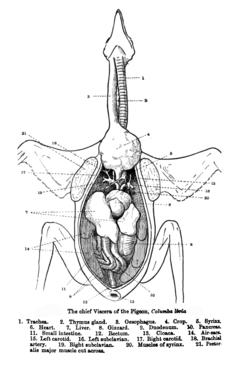 The gizzard, also referred to as the ventriculus, gastric mill, and gigerium, is an organ found in the digestive tract of some animals, including archosaurs (pterosaurs, crocodiles, alligators, dinosaurs, and birds), earthworms, some gastropods, some fish, and some crustaceans. This specialized stomach constructed of thick muscular walls is used for grinding up food, often aided by particles of stone or grit. In certain insects and molluscs, the gizzard features chitinous plates or teeth. The word gizzard comes from the Middle English giser, which derives from a similar word in Old French gésier, which itself evolved from the Latin gigeria, meaning giblets. Birds swallow food and store it in their crop if necessary. Then the food passes into their glandular stomach, also called the proventriculus, which is also sometimes referred to as the true stomach. This is the secretory part of the stomach. Then the food passes into the gizzard (also known as the muscular stomach or ventriculus). The gizzard can grind the food with previously swallowed stones and pass it back to the true stomach, and vice versa. In layman's terms, the gizzard 'chews' the food for the bird as it does not have teeth to chew food the way humans and other mammals do. Bird gizzards are lined with a tough layer made of the carbohydrate-protein complex koilin, to protect the muscles in the gizzard. By comparison, while in birds the stomach occurs in the digestive tract prior to the gizzard, in grasshoppers the gizzard occurs prior to the stomach, while in earthworms there is only a gizzard, and no stomach. "A bird swallows small bits of gravel that act as 'teeth' in the gizzard, breaking down hard food such as seeds and thus helping digestion." (Solomon et al., 2002). These stones are called gizzard stones or gastroliths and usually become round and smooth from the polishing action in the animal's stomach. When too smooth to do their required work, they may be excreted or regurgitated. The mullet (Mugilidae) found in estuarine waters worldwide, and the gizzard or mud shad, found in freshwater lakes and streams from New York to Mexico, have gizzards. The gillaroo (Salmo stomachius), a richly colored species of trout found in Lough Melvin, a lake in the north of Ireland, has a gizzard which is used to aid the digestion of water snails, the main component of its diet. Alligators and crocodiles also have gizzards. All birds have gizzards. The gizzards of emus, turkeys, chickens, parrots, and ducks are most notable in cuisine (see below). Some crustaceans have a gizzard although this is usually referred to as a gastric mill. The belief that Claosaurus had a gizzard has been discredited on the grounds that the fossil remains this claim was based on were another species and the stones merely from a stream. At least some pterosaurs seemingly had gizzards. The most notable cases are Pterodaustro (inferred via gastroliths) and Rhamphorhynchus (directly preserved). Poultry gizzards are a popular food throughout the world. Grilled chicken gizzards are sold as street food in Haiti and throughout Southeast Asia. In Indonesia, gizzard and liver are considered part of a complete fried poultry dish. In Mexico they are eaten with rice or with chicken soup. They are also served grilled and prepared scrambled with eggs, onions, garlic, and salsa; and served with beans and tortillas for breakfast and other meals. Stewed gizzards are eaten as a snack in Portugal. In Hungary it is made with paprika. In Ghana, it is eaten boiled, fried or grilled. Grilled, skewered gizzards, with spices and optional green peppers and onions, are popular. In Nigeria gizzard is either grilled or fried and served with stew and fried plantain. Pickled turkey gizzards are a traditional food in some parts of the Midwestern United States. In Chicago, gizzard is battered, deep fried and served with french fries and sauce. The Chamber of Commerce in Potterville, Michigan has held a Gizzard Fest each June since 2000; a gizzard-eating contest is among the weekend's events. In the Southern United States, the gizzard is typically served fried, sometimes eaten with hot sauce or honey mustard, or added to crawfish boil along with crawfish sauce, and it is also used in traditional New Orleans gumbo. Gizzard and mashed potato is a popular food in many European countries. In France, especially the Dordogne region, duck gizzards are eaten in the traditional Périgordian salad, along with walnuts, croutons and lettuce. In Iran some kebab restaurants mix chicken gizzards in their koobideh kebabs to increase the meat content. In Italy gizzards are often used mixed with other offal. In Japan, gizzard is called zuri or sunagimo; usually it is cooked in yakitori (Japanese style skewered barbecue). In Kyushu (southern Japan), gizzard is fried into karaage. In Korea, chicken gizzard, called dak-ttongjip, is stir-fried and eaten as anju or yasik. The word Sangdana is commonly used to refer to chicken gizzards in Northern India and Pakistan. The word is derived from Persian (Sang = stone and dana = grain). Another name for it is Pathri. It may be served cooked in a curry while barbecued skewered gizzards are also popular. In Nepal, gizzard is called jaatey or pangra. It is eaten most often with drinks. In Yiddish, gizzards are referred to as pipik'lach, literally meaning navels. The gizzards of kosher species of birds have a green or yellowish membrane lining the inside, which must be peeled off before cooking, as it lends a very bitter taste to the food. In traditional Eastern European Jewish cuisine, the gizzards, necks, and feet of chickens were often cooked together, although not the liver, which per Kosher law must be broiled. Kosher butchers often sell roasting chickens with the gizzard, neck, and feet butchered and left in the cavity to be used for making chicken soup. In Uganda, Cameroon and Nigeria, the gizzard of a cooked chicken is traditionally set aside for the oldest or most respected male at the table. Giblets consist of the heart, liver and gizzard of a bird, and are often eaten themselves or used as the basis for a soup or stock. In Taiwan, gizzards are often slow-cooked and served hot or cold in slices, with green onions and soy sauce. In Trinidad and Tobago, gizzards are curried and served with rice or roti bread, it can also be stewed. In Mainland China, duck gizzard is a common snack, eaten alongside other duck parts such as feet, neck, heart, tongue, or head. Areas famous for their gizzard are Sichuan and Hubei provinces. Wuhan city in Hubei is famous for its brand of spicy gizzard, called Jiujiuya (Simplified Chinese:久久鸭). In Northern China, one can find barbecued duck gizzard. The term "gizzard" can also, by extension, refer to the general guts, innards or entrails of animals. ^ a b "Gizzard". Merriam-Webster Online Dictionary. Retrieved 2009-02-05. ^ K. Sakai (2004). "The diphyletic nature of the Infraorder Thalassinidea (Decapoda, Pleocyemata) as derived from the morphology of the gastric mill". Crustaceana. 77 (9): 1117–1129. doi:10.1163/1568540042900268. JSTOR 20107419. ^ Creisler, Benjamin S (2007). Horns and Beaks: Ceratopsian and Ornithopod Dinosaurs. Bloomington: Indiana University Press. p. 199. ISBN 978-0253348173. ^ "Gizzard Fest". Potterville Chamber of Commerce. Retrieved 2009-02-05. ^ Victor Mair (2015), Chinese words and characters for "gizzard", Language Log, 7 January 2015.